The sickening incident has emerged. 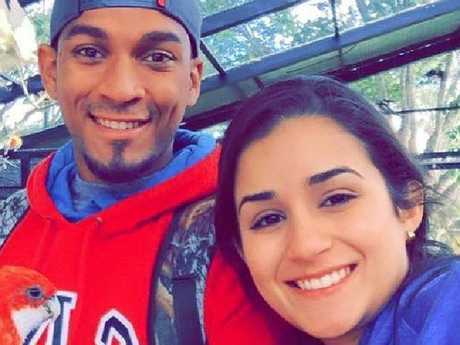 PROFESSIONAL baseball player Danry Vasquez has been kicked off his Pennsylvania team after a video of him beating his then-girlfriend two years ago went public this week. The Venezuelan outfielder was arrested in 2016 on domestic violence charges after repeatedly hitting the unnamed woman and dragging her down the stairs by her hair. The video was obtained and released by KRIS TV, a news company from Corpus Christi, Texas, earlier this week. At the time, Vasquez was playing for the Corpus Christi Hooks, the Double-A minor league affiliate of American Major League Baseball (MLB) franchise the Houston Astros, who cut him days after the incident. Vasquez was arrested on August 4, 2016, two days after he was caught on camera. But his case was dismissed earlier this month, after he completed the ordered anger management courses and paid a fine. No criminal conviction was recorded as his partner refused to press charges. The prosecutor on the case, Nueces County District Attorney Mark Gonzalez, told KRIS TV he was "forced to dismiss the case" because the player had "done everything we asked him to do". "It was an assault that occurred, we had all the evidence to prove it we just allowed this individual to hopefully get the training and education so he wouldn't continue to assault people where he has relationships with," Mr Gonzalez added. Photos on Facebook show the pair stayed together for at least two months after the incident. In October 2016, Vasquez posted a photo of him and the woman, who he names as Fabiana, cuddling on Facebook. Danry Vasquez posted this photo in October 2016. In the translated caption, Vasquez wishes her a happy birthday and calls her one of the most important people in his life. He says she is the love of his life and he will stay with her until the end of the world. "We are a team and nothing and nobody can separate us. Not rabies or the biggest hurricane," he wrote. In 2014, two years before the incident, Vasquez posted another gushing photo of him and Fabiana. Translated from Spanish, the caption read, "Fabiana, I love you. You are the best thing that has happened to me. I am fortunate to have you. I miss you." Danry and his then-girlfriend in 2016. The video, which officials had at the time of the arrest, shows Vasquez lashing out at the woman by smacking her with the back of his right hand, pulling her down the stairs and hitting her again multiple times while she puts up her arms in self-defence. The incident occurred at the Hooks' home stadium Whataburger Field. 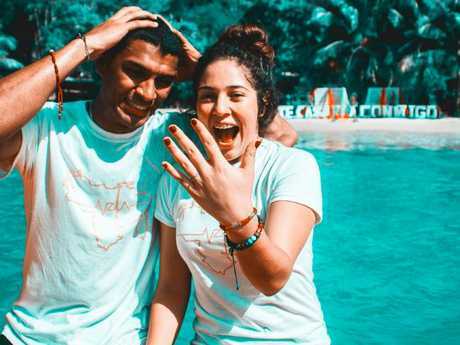 Despite the couple staying together for an undisclosed amount of time after the incident and court case, the 24-year-old is now married to another woman. Vasquez proposed to the woman in November last year and they were married in February. A close friend of Vasquez's confirmed to news.com.au the married couple were dating for at least a year before he proposed. 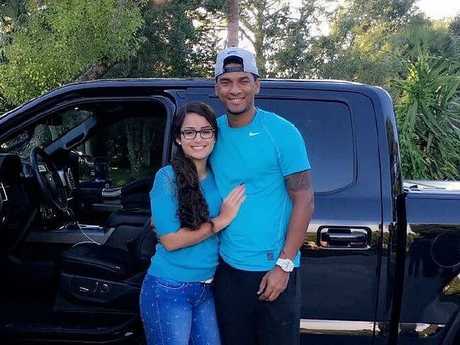 Danry Vasquez with his wife. The Lancaster Barnstormers, a professional team in the Atlantic League that had signed the 24-year-old following the incident, cut ties earlier today. "There is no choice but to sever the relationship," said the team's manager, Ross Peeples. "Neither I, nor the Barnstormers' organisation as a whole, can condone or associate with that behaviour." Per US reports, Vasquez returned to Venezuela to play professional baseball for two seasons after being cut by the Astros and Hooks. At the time of his signing with the Barnstormers, Peeples was excited to welcome the new recruit. "Danry is a guy whose name I got from someone in winter ball," Peeples said. "After talking with several other people about him, I am very excited to bring him in. He was a prospect a few years ago and is still pretty young. I am excited to see what he can do in our ballpark." EDITOR'S NOTE: The video below shows the graphic assault. We understand it's confronting to watch, but we have chosen to show the footage to highlight the issues of domestic violence. 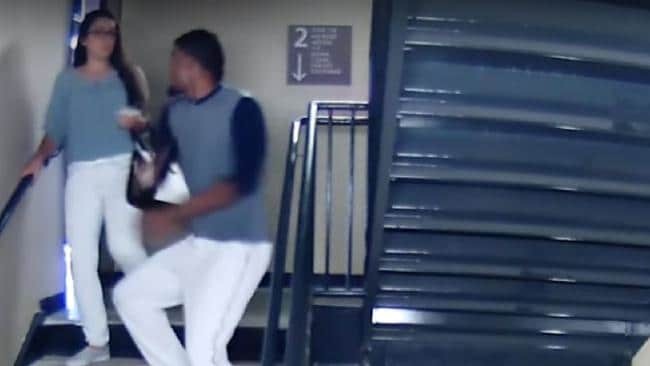 Baseball player attacks girlfriend: CCTV vision of baseball players attack on his girlfriend in stairwell. With The New York Post.